Enjoy a supercool cruise on board the luxury catamaran! Relax on the deck in the sunshine and then cool off in the pool. Get the best view from the bridge and spot Liam on the personal water scooter towing Stephanie on the banana boat—two friendly dolphins have come to play with them! Head below deck to chill out in the lounge and gaze through the catamaran's clear bottom. Then head to bed ready for another exciting day at sea! Price is 46% below the initial Lego retail price, a € 34.60 discount! This comes down to 6.80 cent per brick. The Sunshine Catamaran (41317) Lego set is available from the sites below. However, they do not offer delivery to your selected region. The Sunshine Catamaran (41317) Lego set is no longer directly available from the sites below. However, 3rd party partners of these sites might still have the set available. Alternate description Jump aboard the luxury Sunshine Catamaran with friends! Includes 3 mini-doll figures: Olivia, Stephanie and Liam, plus Sheen and Sapphire the dolphin figures. Features a 3-level catamaran, personal water scooter and a banana boat. Catamaran features a sun deck with 2 sun loungers and a pool, bridge with steering controls and a seating area, slide into and spiral stairs up from the water, opening garage for the personal water scooter, and living quarters with a kitchen, bedrooms and lounge with sofa and transparent-brick floor. Accessory elements include an inflatable ring, life preservers, flippers, ice creams, popsicle, baskets, newspaper, smartphone and an mp3 player. 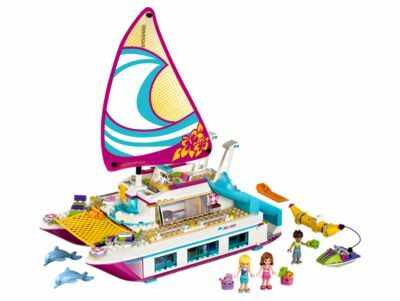 Take a luxury vacation on the LEGO® Friends Catamaran and enjoy the pool on deck. Take the top off the boat to play in the living quarters and see the clear bottom in the lounge. Have fun with friends on the banana boat or inflatable ring towed by the personal water scooter. Make friends with the dolphins as they swim alongside the catamaran. LEGO® Friends Sunshine Catamaran does not float on water. Catamaran with sail measures over 12” (32cm) high, 11” (29cm) long and 6” (17cm) wide. Personal water scooter measures over 1” (5cm) long and 1” (3cm) wide, and under 1” (2cm) high. Banana boat measures over 3” (10cm) long and under 1” (2cm) high and 1” (1cm) wide.